Situated by the ocean, this hotel is within a 10-minute walk of St. Simons Lighthouse Museum and Saint Simons Island Pier. Neptune Park and Demere Park are also within 1 mi (2 km). 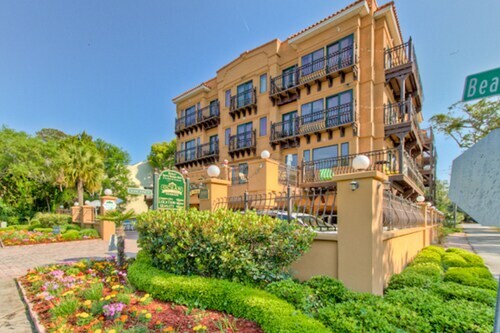 Situated in a shopping district, this hotel is 2.5 mi (4 km) from Bloody Marsh Battle Site and within 6 mi (10 km) of Christ Church, Frederica and Fort Frederica National Monument. Saint Simons Island Pier and St. Simons Lighthouse Museum are also within 6 mi (10 km). 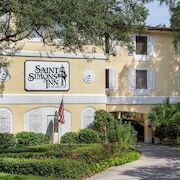 Situated in St. Simons Island, this hotel is 2 mi (3.3 km) from Neptune Park and 2.7 mi (4.3 km) from Little River. Christ Church, Frederica and Brunswick City Hall are also within 9 mi (15 km). 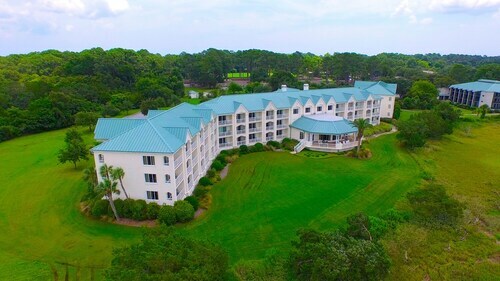 Situated near the beach, this resort is 1.5 mi (2.4 km) from Mildred Huie Museum at Mediterranean House and 3 mi (4.8 km) from Saint Simons Island Pier. Bloody Marsh Battle Site and Little River are also within 2 mi (3 km). Situated by the ocean, this hotel is 1.4 mi (2.2 km) from Mildred Huie Museum at Mediterranean House and 2.9 mi (4.6 km) from Saint Simons Island Pier. Bloody Marsh Battle Site and Little River are also within 2 mi (3 km). 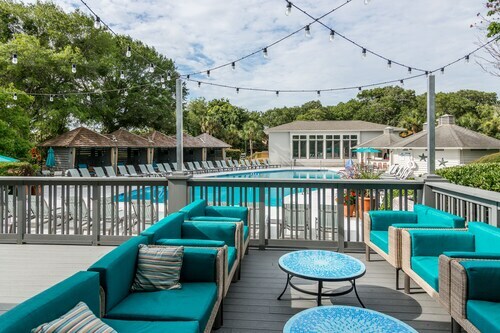 Centrally located on St Simons Island, a short distance from the beach, pier, and village area, this resort is 17 miles from Jekyll Island. Situated by the ocean, this bed & breakfast is within a 10-minute walk of St. Simons Lighthouse Museum and Saint Simons Island Pier. Neptune Park and Demere Park are also within 1 mi (2 km). 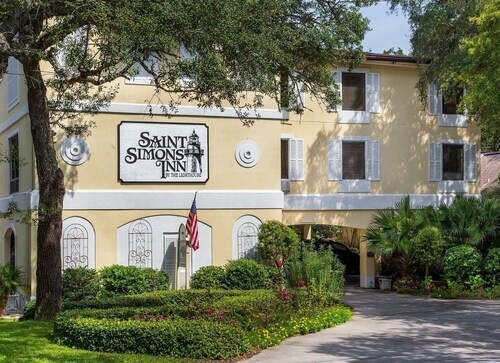 Offering direct access to the beach, this St. Simons Island resort is in the historical district, 0.4 mi (0.7 km) from Demere Park, and 1.4 mi (2.3 km) from Saint Simons Island Pier. Neptune Park and Maritime Center at the Historic Coast Guard Station are also within 1 mi (2 km). 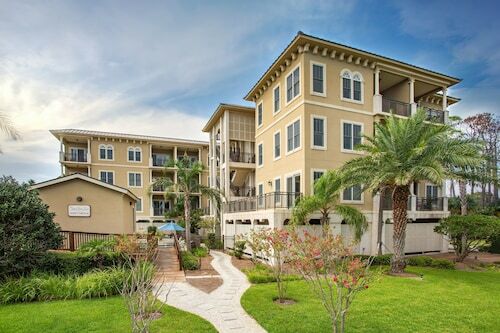 Situated near the beach, this condo building is within 1 mi (2 km) of Demere Park and Saint Simons Island Pier. St. Simons Lighthouse Museum and Neptune Park are also within 15 minutes. 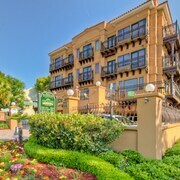 How Much is a Hotel Room in St. Simons Island? 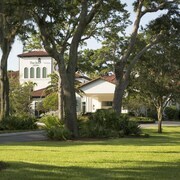 Hotels in St. Simons Island start at $114 per night. Prices and availability subject to change. Additional terms may apply. Your feet move the pedals rhythmically, their familiar circular pattern soothing and reminiscent of summer days spent biking around your neighborhood as a child. The wind brushes past your cheeks and the sweet smell of the sea is so tantalizing, that you can almost taste it. Your calves begin to ache with exhaustion, but you know you can’t slow down just yet—you’ve almost made it. Just when you think you need to pull over to the side of the walkway, your gaze land on the shore’s white sand, which glistens in the orange midday light. You propel your body toward the water. There’s nothing like catching a sunset on St. Simons Island, a fact you’ll come to accept once you visit. You’d do anything to enjoy watching the massive celestial body go down over the breaking waves. But the solution is simple: Reserve St. Simon Island hotels and enjoy the natural performance at your leisure. A good vacation destination is much like a fine glass of wine. It has proven itself to be worthwhile over time, has many different notes to decipher, and it brings more happiness than is imaginable. 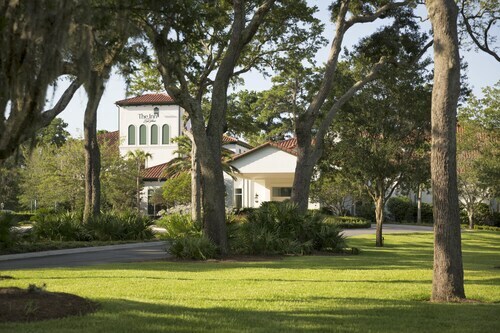 St. Simons Island fits the bill, and so will the wine you enjoy at hotels in St. Simons Island. Although there are a plethora of beaches to admire, historic landmarks to photograph, and wildlife to identify, there’s no better place to experience St. Simons than from the top of the St. Simons Lighthouse Museum. Your excitement will build as you ascend the lighthouse’s steps. Perhaps this relic from 1872 instills a touch of patriotism in you, so you eagerly climb a little faster to reach the top. Sweeping views of the sea await you, and you take a mental picture to remember not just the sight, but the feeling of bliss that overcomes you. When you’re ready to return to the regular world, descend and utilize one of our St. Simons Island rental cars to return to your comfortable accommodation. Your problems seem far and few between when there’s sand between your toes and a cold lemonade in your hands. 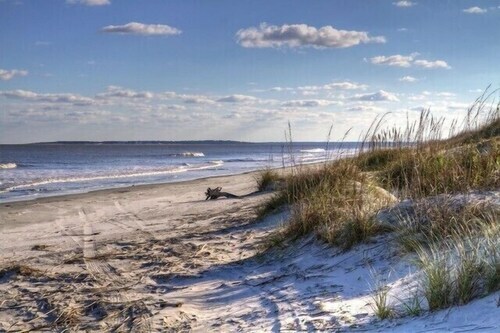 Bottle up the feeling of island life and bid hotels near St. Simons Island adieu. And for those curious wanderers who still aren’t ready to return to daily life, ease into things by driving 75 miles south and staying the night at Jacksonville hotels. Your suntan and smile will be a dead giveaway of where you’ve come from. Overall the property was very nice and the hot tub by the outside pool was excellent! The only thing I noticed was that the bathrooms are missing a way to hang towels which would have been convenient. The property is pretty, and in an excellent location. The staff was helpful and welcoming. Breakfast was great - eggs, bacon and waffles, as well as all the regular smaller dishes. The room was clean and neat. Just shampoo, conditioner, lotion and soap. No q-tips or makeup mirror, or shower cap. Overall, very nice. I liked the personal attention we received when we registered. My husband is handicapped, so we were a little upset that the tub had no bars for safety, and no nonskid strips that I could see. So he had to miss a shower. Handicap parking was very convenient though. I would’ve liked a place to charge my phone. If it was there I missed it sorry. We did have a nice day, and love the place! We had a handicapped person with us and for him to get up the stairs and down was a problem. There were only three chairs at the table and you had to climb up on them! Not enough cutlery - only two teaspoons. Not close enough to the beach. Toilet holder broken. Tin opener wouldn't work. No blankets. Stair carpet dirty. No bath mat. Rugs slippery. The place was adequate, but not as good as advertised. We loved the facility, staff, breakfast and beautiful location.